Is it possible to eat healthier without giving up your favorite fried foods? Choosing the best air fryer may be the solution to this dilemma. Most of us have cravings for fried foods. Some people crave potato chips, some French fries, and others want onion rings. The problem is that deep-fried food can cause health issues, such as higher cholesterol levels. For some people, they can contribute to weight gain, clogged arteries, and even heart disease. Frying food, even in oil considered healthier, such as olive oil, sunflower oil, canola, safflower, and peanut oil, can still put your health at risk. You may have already had to remove fried foods from your diet for weight-loss reasons. If you want that great fried food fix, without the same risks, you will want to learn more about an air fryer. Air fryers cook your food in an enclosed space by replacing the oils and fats you previously used with a stream of temperature-controlled hot air. In this way, they work very much like convection ovens. Granted, in some recipes, such as French fries, a light mist of oil may be necessary to achieve the desired texture and crispness. Still, this small amount of oil is minuscule compared to dunking them in quarts of boiling oils or fats. Some of the best air fryers will not only allow you to air-fry your food, but also bake, roast, or quickly heat any food you wish. Features differ from model to model, but for the most part, you simply set the time and temperature to produce hot, crispy food, Not only do some recipes taste as good as fried, but they turn out much healthier and far easier to clean up after. Your decision on which one to buy may be partially dictated by where it will end up. Considering counter space can become very important when you add any new appliance to your kitchen’s arsenal of appliances. Even in a large home, counter space can quickly disappear as you add more and more cooking conveniences to your collection. Do not expect to get fried chicken or any other traditional deep-fried food to taste exactly “like Mom used to make.” Even the very best air fryer on the market can't promise to do that. You will, however, get appetizing and easy-to-cook meals, side dishes, and snacks that are tasty enough to become a regular fixture at your dinner table. It will certainly make your late-night snacking faster and more convenient. How Did We Arrive At This List? Our conclusions for which were the best air fryers come from data from several sources and many locations. 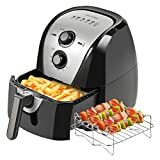 The best air fryers were determined partly based on sales figures from retail outlets such as Walmart, Best Buy, and Amazon. Although opinions and claims from individual manufacturers websites carry less weight than those from other sources, the test results from facilities such as Good Housekeeping, Underwriters Laboratories, and professional reviewing sites entered heavily into the decisions. 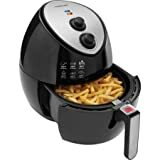 Perhaps the most important source of data was the ratings and reviews by the people who actually used and commented on their experiences with each air fryer. Is One Of These The Best Air Fryer For You? No two lists will ever agree point by point on which units will hold the title of best air fryer, but this list reflects our results after considering all of this available data. It is not meant to be absolute. No list can be, because different people have different preferences in appliances. It will, however, give you a good idea of features and details for each model that will allow you to better make your purchasing decision. Let’s look at a few that rate as some of the best air fryers available for a number of different reasons. 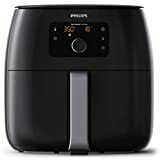 Our overall favorite unit is the Philips Avance Collection XXL Digital Twin TurboStar air fryer, which features "TurboStar Technology." This function keeps hot air circulating in several directions at once for more even and consistent cooking. It also brings the Phillips Avance up to operating temperature fast and cooks your food more evenly and consistently than traditional air fryers. Because of this, it will also require a minimum amount of oil, if any at all. The Avance air fryer also boasts four pre-sets to cook some of the most common foods as easily as pushing a button or two. The timer allows you to organize your cooking so that all your dishes will be ready at the same time. It has a digital readout for more precise settings and a “keep warm” function in case you get distracted during the cooking process. Customers cited the "EasyClick" handle as a positive feature. This allows you to disassemble it down to the dishwasher-safe components quickly for easy cleaning. On the downside, several customers mentioned that it worked best if you only fill the basket halfway, and some found the manual somewhat confusing. Measuring 15.9 by 15.5 by 15.5 inches and weighing 23.9 pounds, prices online range from $$$ to $$$. The HF-919b is a very basic air fryer, but you should not let the simplicity of design dissuade you. It cooks your food fast and efficiently by using dials for both time and temperature settings. The basket and tray come apart easily and are both are dishwasher safe. 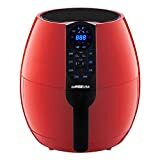 Despite its simple design, the Faberware multi-functional air fryer arrives as one of the easiest to use and fastest to master of any of the units on this list. An ideal gift for newlyweds or college dorm dwellers, the 3-quart frying basket is just the right size for a quick plate of snacks or a small dinner. The Faberware unit impressed customers with its affordable price, wide availability, and the easy-to-set timer that cooks for up to 30 minutes. They also liked the automatic shutoff, loud bell timer alert, and small countertop footprint. However, a few also thought it had a limited capacity and were not impressed with the less-than-precise knob controls. It measures 26.6 by 14 by 13.2 inches and weighs in at a slight 11.75 pounds. It comes with a recipe book and a two-year warranty, and you'll find it priced online from $$ to $$. The GoWise GW22621 makes up for its medium-sized capacity by offering several options not found on typical larger units. Seven individual cooking options make it among the easiest to operate and most versatile air fryer available. Designed with a “load it and go” mindset, the GoWISE GW22621 uses a powerful air circulation that cooks everything fast and evenly. The temperature ranges from a slow cooking 175 to a full 400 degrees Fahrenheit. The very bright digital touchscreen makes setup and operation easy on the eyes. Cooking time varies from 1 minute to 30 minutes, and when the cooking is complete, the unit puts itself in standby mode. Among the features that customers were impressed with was the accuracy of the controls, the easy-to-clean components, and the manageable countertop footprint. However, some found it a bit small for their needs and others thought the plastic buttons gave it a cheaper feel. The footprint is small at 13.5 by 12.5 by 11.5 inches, and with a weight of only 4 pounds, you can store it anywhere and bring it into the kitchen when the need arises. it has an average cost online of between $$ and $$. Another “set and go,” easy-to-operate air fryer, the Ultrean may not be the unit with the largest following, but it certainly has an enthusiastic customer base. It comes with a timer that runs up to 30 minutes, a temperature range of 180 degrees to 400 degrees, and an impressive sleek design. Customers were impressed with the “Rapid Air Technology” that provides consistent and even airflow that also permits grilling, roasting, and baking. Consumers commented positively on the easy-to-disassemble and clean nonstick pan, heat-resistant handle, and dishwasher safe basket. Add to that the LCD screen, precise computer controls, and competitive price, and you can see why it is a hit with those who have purchased it. Measuring about 12 by 10 by 10 inches, this compact unit rated a sky-high 4.8 out of 5 stars on Amazon. You'll find the Ultrean priced online from between $$ to $$. As we mentioned at the beginning of this list, an air fryer works somewhat like a convection oven. In the case of the Cuisinart TOA-60, we have a full-size toaster over with a built-in air fryer function. 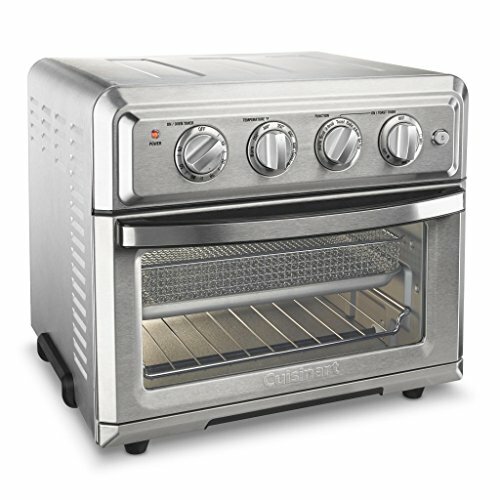 It not only toasts, broils, bakes, and reheats, but it also lets you air fry food right inside the oven. Because you only need one appliance, it commands much less precious counter space. And it's right at your fingertips when you need it. This 1800-watt, seven-function unit has a 0.6 cubic foot capacity and is large enough to prepare 3 pounds of air fried food. Because of its versatility and size, it can also bake a four-pound chicken, cook a 12-inch pizza, or make six slices of toast. The inside is so large, it comes with an interior light. Fully adjustable and boasting a non-stick interior, the TOA-60 is praised by consumers as being very easy to clean and unexpectedly quiet when operating. Amazon shoppers rated it 4.3 out of 5 stars. 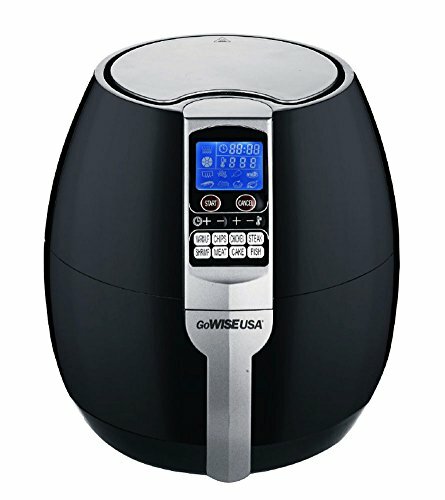 Secura has been making quality pressure cookers for years, and now they have entered the air fryer realm with the Secura 1500-watt electric hot air fryer. This unit scores high marks in durability, price, and versatility. 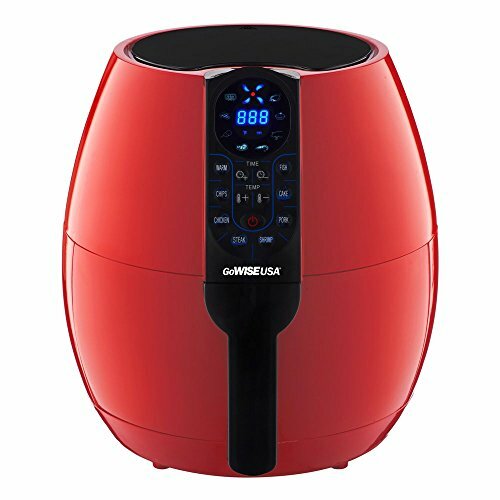 The Secura 4-liter air fryer has variable temperature control and easy operation controls. And the sleek, black finish looks good on your kitchen counter. It includes skewers, a toaster rack, and an extra-large capacity that easily accommodates more food. The “Rapid Flow” air system assures that all of this food is still cooked evenly and thoroughly when the timer goes off. 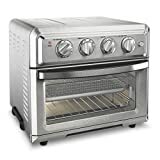 Users seem most impressed by the versatility of this unit, and the quality of cooking produced. Measuring 14.8 by 12.4 by 13.1 inches and weighing 10.3 pounds, the Secura unit received an impressive 4.5 out of 5 stars from Amazon buyers. Prices online varied widely, ranging from $$ to $$$ at various outlets. Slightly smaller than the Avance unit above, this air fryer also incorporates "TurboStar Technology." This feature keeps hot air circulating in several directions at once causing the food to cook more evenly with a minimum amount of oil, if any. The Avance HD9240/94 Air Fryer has four pre-settings that cook the most common foods at the touch of a button or two. The time feature allows you to organize your cooking schedule so everything is ready at the same time. Customers we pleased that it comes with dishwasher safe easy to clean basket and drip pan. They also appreciated the keep-warm function and the extensive recipe book. The "EasyClick" handle that quickly disassembles the washable parts turned out to be another user favorite. Some users were unhappy that the basket worked best if only filled halfway, and that many of the accessories are only available from overseas. Boasting an impressive 4.3 out of 5 stars rating on Amazon, this 2.65-pound capacity air fryer is widely available at both internet locations and brick-and-mortar department stores. It measures 16.6 by 12.4 by 11.9 inches and weighs about 18 pounds, and you'll find it online priced between $$$ to $$$. 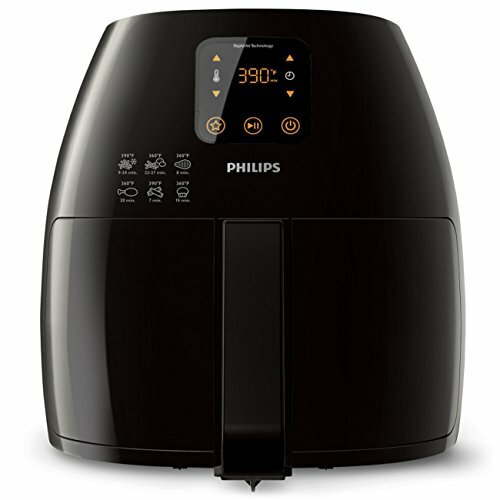 Which Is The Best Air Fryer For You? The variety of air fryers has significantly expanded as more people are choosing to eat healthier. It is now possible to purchase a unit that not only makes your diet healthier but also makes the process easier and more convenient no matter what your budget. If you're looking for a starter unit that will prepare your snacks, side dish, and occasional entre, the reliable Faberware HF-919b will fill the bill and at a relatively modestly priced. Are you be leaning toward incorporating your new air fryer as a more serious kitchen tool for making your family meals? If so, something a bit larger and a little more versatile, such as the Philips Avance XXL Air Fryer will better suit your needs. It has a larger capacity and provides numerous cooking options. If versatility is your number one consideration, you will be happy with the Cuisinart TOA-60 or the GoWISE GW22621. Consider what you want to use it for and how much you want to spend, and you should be happy with any of these models. When you take into consideration all the various styles, options, and sizes available, it may still take you a bit of additional research to find the right model. We believe that you can’t go wrong with any of these fine units. 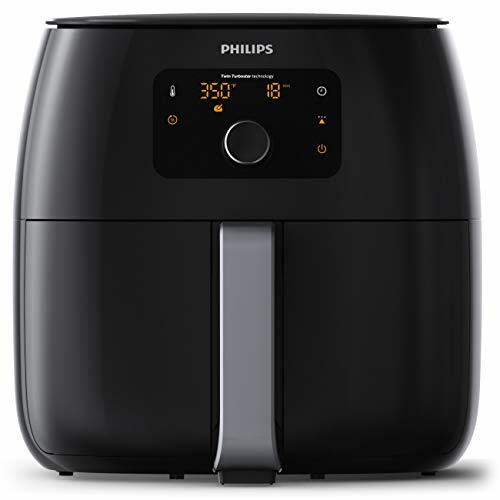 However, if you don’t see exactly what you are looking for, hopefully, we have started you thinking about what qualifies as the best air fryer for you.